Plans are well in hand for Reepham’s Christmas event, the Festival of Light, which is being held on Thursday 8 December, starting at 4.30 pm. It was very satisfying to welcome new faces to the FOL team as a result of the appeal we put in Reepham Life back in September. We have more than 30 stalls booked to attend, a craft fair in St Michael’s and Santa’s Grotto in Bank House, as well as a full entertainment programme that will include carol singing, music, dancing and lots of family fun. 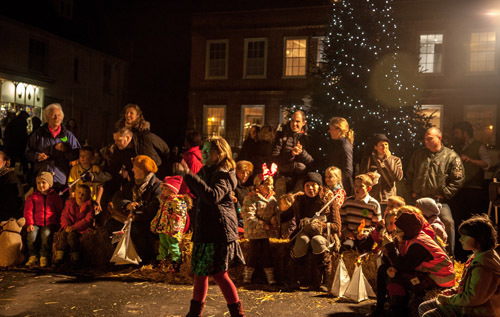 The festivities will once again start with a magical children’s lantern parade from St Mary’s at 5 pm. We are very grateful to Caitlin Howells, Broadland District Council and Reepham Primary School for organising a lantern-making workshop in readiness for the parade. However, any child who wishes to join the parade may do so and can bring a torch or home-made lantern – but no candles or lanterns with naked flames please. Children (and parents) should gather in St Mary’s at 4.45 pm in readiness for the parade. Setting up for the event takes some considerable time on the day, so we have obtained permission to close the Market Place to traffic from 1 pm onwards. Please ensure you do your shopping before then or park elsewhere. We would be particularly grateful if residents and other market place users could move cars from the roadside between the Market Place and the church and between the Market Place and Townsend Corner by 1 pm as these spaces will be needed for stalls on the day. The Festival of Light could not happen without the considerable support of a number of Reepham organisations and businesses. Special thanks go to The Original Cottage Company who will once again be hosting Santa’s Grotto, Reepham Town Council who have given us financial support to cover the cost of St John’s Ambulance attendance, Reepham Life who have kindly donated the presents for Santa to give to the children, Geoff Deal of Meloncaulie Rose who has organised a blues band to play during the event and Graham Andrew of Funforce who has put together the rest of the entertainment programme. Finally, when you come along to the Festival of Light, can I suggest you bring a light? Then we will indeed see you there.